And what if global warming melts the permafrost? 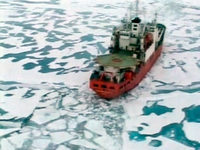 Yuri Averyanov, a member of the Russian Security Council Administration, declared this week in an interview with Rossiiskaya Gazeta that climate change will pose a serious threat to Russia’s national security and that the melting permafrost could cause Russia “serious trouble” within ten to fifteen years. The result of this, according to Averyanov, will be that thousands of kilometres of pipelines, railways and roads will be in danger, along with a great number of towns and villages. He predicts that in Yakutsk, Tiksi and Vorkuta up to a quarter of all homes could be rendered useless due to unstable conditions of the soil arising from the meltdown.